Joanie's Classy Card Corner: DT Calls!!! Challenges!!! Make my day and send me a note saying "We Want You." ; ) They are some really great challenges out there and hopefully I will win one. They also have a few Designs Team Calls that are awesome and I would definitely like to become a DT member on those, so here goes. Good Luck to ME!!! lol Here is my card I am submitting and I hope it's liked enough to get me where I would like to go. Wish me luck!! Flower and pearls from my stash as well. The Image is so cute and I got it over a year ago, but can't remember what her name is. Well, time to move on and get all the blogs posted. I would be so excited to be a Design Team Member as I love meeting ladies through the blogs that are interested in the same type of crafting I am. I have made many friends. I thoroughly enjoy cardmaking and do many different types. Just depends on how the Mojo is flowing or if there is a certain sketch or product involved. Just great for making a happy day. And for some reason, give me a rainy day and oh, gosh, I don't leave the scraproom. LOL Now that's a scrappy day. ;) So ladies, here is my card and I hope you are pleased enough to give me a spot. Thanks for the opportunity to apply. Anything Goes Challenge #100, in the Garden, Add some butterflies. Ribbon Carousel Challenges - RCC84, Summertime Fun, must be something spooled.. My Ribbon is spooled item. So this is my story and I am sticking to it!! Pretty card! Good Luck. Thank you for joining us at Party Time Tuesdays. great card! Good luck with your DT calls! Thanks for joining us at Use It Tuesday and hope to see you again! Lovely card. That little girl is adorable. Thanks for playing along at UIT! Beautiful card. Thanks for entering at crafty ribbons but unfortunately our current challenge is back to school not anything goes. I hope you get time to join in again with our back to school theme. Hi Joanie; I love your cute card! 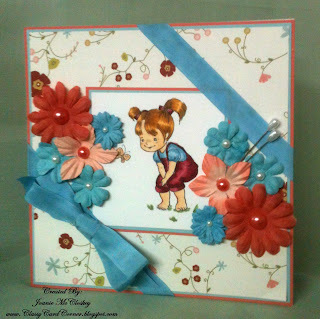 Thanks for joining Crafty Ribbons Challenge this week! But; Please note that this weeks challenge at Crafty Ribbons has the theme "Back to school". Love your design hun. Very cute image & love the DP's you have used. Thank you for submitting your entry to my DT Call. Good luck & fingers crossed. Hugs, Lisa. Love your fabulous cute card.